Ogni posto è dotato di un tecnologico sistema multilingue che vi accompagnerà durante la visita guidata. Con l’ausilio delle cuffie vi informerà sulla storia e le origini dei più importanti siti d’interesse storico, culturale e sociale: monumenti, musei, architettura, arte e shopping. 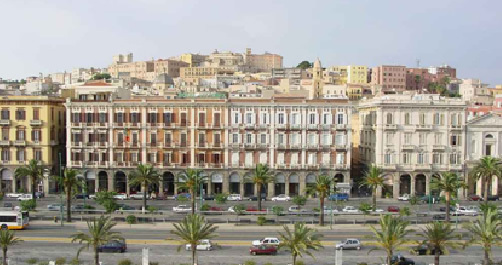 A unique and fun one-hour tour to visit the spectacular and characteristics sities that make Cagliari one of the most beautyful and welcoming cities in the mediterranean. From the comfort of your seat, you will see the monuments and natural and architettural delights of the city from a different perspective, thanks to the unusual shape and size of yhe bus that can even drive throught tha walls and in to the acient city. Throught the headphones, you will be informed all about the history and origins of the city's most important historical, cultural and social sites with details of its museums, architecture, art and shopping. 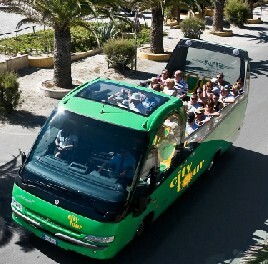 This is particularly interesting itinerary that will introduce you to and help you discover the ancient and more recent history of this delightful Mediterranean capitalEach seat is fitted with highly tecnological and multilingual audio system that will accompany you during your guided visit. Costruito nei primi del novecento, è realizzato con pietra calcarea che ne rende l'aspetto bianco. L'architettura è una equilibrata sintesi tra il neo gotico e il nascente Liberty. Le finiture e le decorazioni esterne furono completate nel 1914, anno di insediamento del consiglio comunale. Particolarità dell'opera sono le due torri a pianta ottagonale che svettano sul prospetto principale, mentre l'intera costruzione si articola intorno all'ampio cortile. 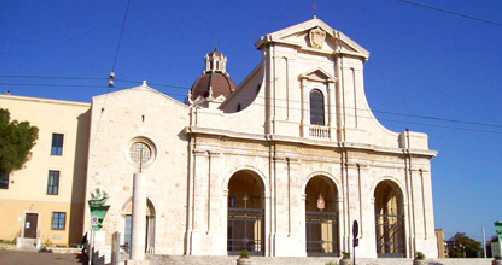 Le origini del santuario risalgono al 1324 e si devono all'infante Alfonso d'Aragona che decise di edificare la chiesa per fornire assistenza spirituale ai militari impegnati nell'assedio della città. Nel 1370 i padri Mercenari rinvenirono nello specchio d'acqua antistante la chiesa una cassa contenente la statua di una Madonna: la Vergine di Bonaria. La Vergine, che si può ammirare all'interno dello splendido santuario, ben presto divenne il simbolo dei naviganti e, nel 1908, patrona dell'intera Sardegna. Oggi parco regionale lo stagno di Molentargius dal 1993 è diventato resdienza stabile dei fenicotteri rosa, che hanno scelto questa meravigliosa zona umida per la nidificazione. Una colonia di oltre 11.000 esemplari che si aggiungono alle 180 specie di uccelli diversi tra cui i polli sultani, gli aeroni, i cavalieri d'Italia, le garzette, i germani reali, le beccaccine, le folaghe e le ovocette. Imponente opera di sistemazione urbanistica realizzata fra il 1899 e il 1902 utilizzando il calcare del colle di Bonaria. La sistemazione interessa i tra bastioni di Santa Caterina, Saint Remy e della Zecca, che delimitano la parte meridionale del Castello. L'opera si articola su due grandi terrazze e una passeggiata coperta oltre al suggestivo camminamento che collega a Via Universita. 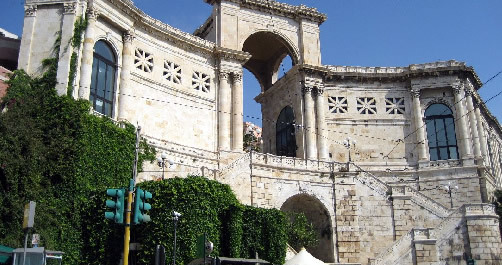 La scenografica scalinata di marmo a doppie rampe consente l'accesso al monumento dalla sottostante Piazza Costituzione. Il viale Buoncammino rappresenta uno degli angoli più suggestivi della città. Il panorama sul golfo di Cagliari che si può godere dai suoi lunghi viali incanta per luce e bellezza. Nelle sue vicinanze si trovano le vecchie porte d'accesso alla città antica e le rovine dell'Anfiteatro romano. Dal 1859 sul viale domina il nuovo carcere della città, realizzato in due distinti periodi e considerata una struttura inviolabile e tra le più sicure d'Italia. Negli anni ha ospitato “illustri personaggi” che hanno segnato la storia del banditismo sardo. È senz'altro il più grande monumento romano presente in Sardegna. Del monumento resta solo la parte scavata nella roccia, realizzata nel III sec. D.c. sfruttando il degrado naturale di due pareti rocciose dalle quali sono state ricavate le due scalinate. Utilizzato per anni come discarica all'aperto, divenuto di proprietà comunale nel 1866 venne riportato alla luce e al suo splendore naturale. 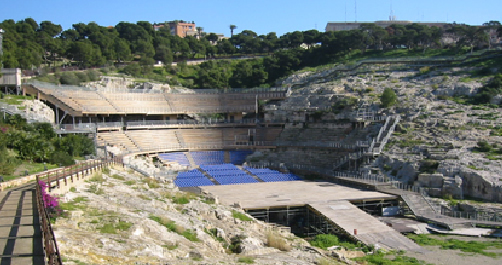 Dal 2000 il monumento ha ospitato diversi spettacoli teatrali, lirici e di folklore. Posizionata nella parte più alta del Castello un tempo l'area era utilizzata come Regio Arsenale. Solo nel 1966 partirono i lavori di sistemazione del grande complesso museale realizzato saldando manufatti in cemento armato con le antiche strutture difensive e le rocce calcaree. Attualmente vengono ospitate la Pinacoteca Nazionale, la raccolta di cere anatomiche, la collezione di arte siamese e il museo archeologico, che espone numerosi reperti della civiltà preistorico nuragica. Chiamata in antichità "Porta del Leone", fu realizzata nel 1305 per ospitare le Regie carceri sino al loro definitivo trasferimento nell'edificio realizzato sul colle del Buoncammino. 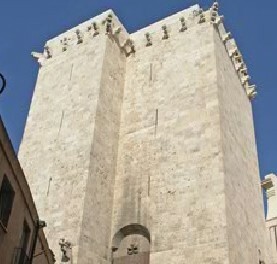 Per secoli da questa torre si levò il rintocco della "campana cattiva" che accompagnava i condannati al patibolo. Alta circa 37 metri prese il nome dalla chiesa dedicata a San Pancrazio, oggi chiesetta di San Lorenzo. Le sue origini risalgono al XIII secolo ad opera degli architetti pisani. Negli anni la chiesa ha subito diverse trasformazioni, tanto che dell'originale struttura restano pochi elementi tra cui le porte laterali. L'attuale facciata, simile a quella originaria venne realizzata intorno al 1930 in stile romanico-pisano-lucchese. 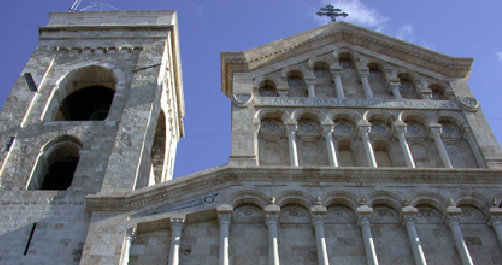 Di grande interesse le dodici cappelle e il presbiterio, la cripta e il tesoro del Duomo. Prende il nome dalla presenza, su una mensola incassata ad un angolo della stessa, di un piccolo elefante in marmo. L'opera venne eretta nel 1207 per volere dei Pisani; alta circa 38 metri veniva utilizzata per scopi difensivi. Nell'Ottocento la torre venne utilizzata come carcere per la detenzione dei prigionieri politici. Resistono al tempo le possenti saracinesche in ferro realizzate al tempo della costruzione. 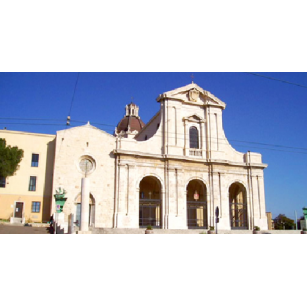 Dating from the early twentieth century, it was built in calcareous stone, witch gives it its white colour. The architecture is a harmonious balance between neo-gothic and early Liberty style. The exterior decoration and details were completed in 1914, the year the town council took place here. An unusual feature of the building is the two, octagonal towers that soar above the main facade, while the whole building surrounds a large courtyard. The origins of the sanctuary date back to 1324 and was commissioned by the Infant Alphonse of Aragon who decided to build a church here in order to offer spiritual assistance to the soldiers committed in the siege of the city. In 1370, the Mercenary Fathers found a chest containing a statue of a Madonna – the Blessed Virgin of Bonaria – in a stretch of water opposite to the church. The Blessed Virgin, which is now placed inside the splendid sanctuary, soon became a symbol for sailors and seafarers and in 1908 was named the Saint patron of Sardinia. Nowadays it's a regional nature reserve, in 1993 Molentargius Pound became the permanent home of pink flamingos, that chose these wonderful, wetland area for nesting. There is now a colony of over 11,000 birds, as well as 180 other species of birds, including purple gallinules, herons, stilt plovers, little agreets, mallards, snipes and coots. This is a great urban complex, created between 1889 and 1902 using limestone from Bonaria Hill. It consists of three bastions of Saint Catherine, Saint Remy and Zecca (or Mint) that mark the boundary of the southern part of the Castle. It includes two large terraces and a covered walkway, as well as a delightful communication trench that connects it to Via Università. The spectacular, two-flight marble stair case offers access to the monument from Piazza Costituzione on the under part. Viale Buoncammino is one of the most charming parts of the city. 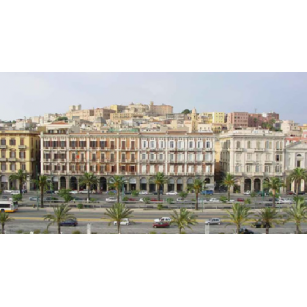 The long, narrow streets afford spectacular panoramic views of the Gulf of Cagliari, a mix of lights and outstanding natural beauty. 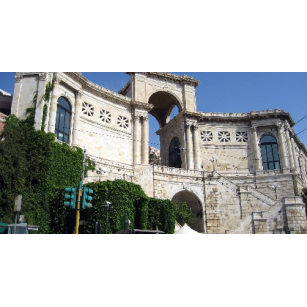 Nearby there are the former gates to the old city and the ruins of a Roman Amphitheatre. Since 1859 the streets has been dominated by the city's new jail, which was built in two separated periods and it's considered inviolable and one of the safest in Italy. In the years, it has hosted many “illustrious figures” that marked the history of Sardinian banditry. This is without doubts the largest Roman monument in Sardinia, which was build in the 3rd century AD, although all that remains is the part carved into the rock that exploited the natural decay of the two walls of rocks where the two staircases were carved out. For years it was used as an open-air dump, but after becoming municipal property in 1866 it was returned to its former glory and natural beauty. Since 2000, the monument has hosted a series of theatre, opera and folk music shows. Located on the highest part of the castle, the area was once used as the Royal Arsenal. 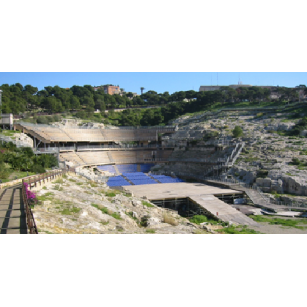 However, it wasn't until 1966 that works began to create the large museum complex, built by combining simple reinforced concrete structures with the ancient defensive buildings and calcareous rocks. It currently host the National Art Gallery, a collection of anatomical waxes, a collection of Siamese art and the Archaeological Museum, which host numerous finds dating from prehistoric-nuragic civilisation. Formerly know as the "Lion's Gate", this was built in 1305 to host the Royal Jails, until these were finally transferred to the building on Buoncamino Hill. For centuries it was from this tower that the "Bad Bell" tolled to accompany those condemned to death on their way to the gallows. Around 37 metres tall, the tower took its name from the church dedicated to Saint Pancras, which is now the church of Saint Lawrence. The cathedral's origins date to the thirteenth century and it was built by architects from Pisa. Over the years the building has undergone a series of transformation and indeed only a few original elements, such as the side doors, remain. 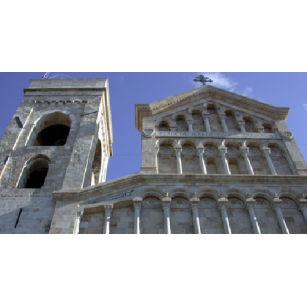 Similar to the original, the current facade was built around 1930 in Romanesque-Pisa-Lucca style. The twelve chapels and the presbytery, the crypt and the cathedral's treasures are very interesting. 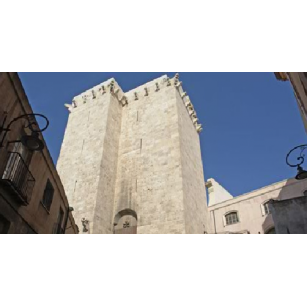 This tower takes its name from the presence of a small, marble elephant on a ledge sunk into one of its corners. It was built in 1207 by the Pisans, it's about 38 metres tall and was used for defensive purpose. 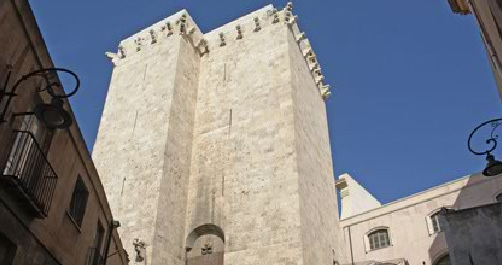 In the nineteenth century the tower was used as a jail for political prisoners. The imposing iron portcullises realized when it was built, have stood the test of time impressively.